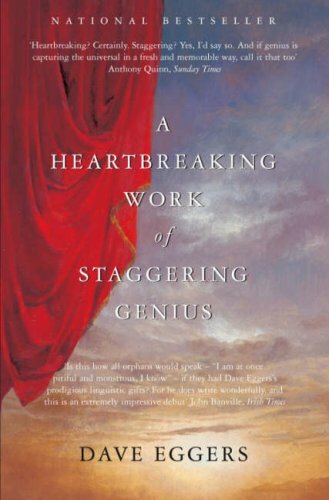 A Heartbreaking Work of Staggering Genius is the memoir (or autobiography if you prefer of Dave Eggers). It tells the story of his life after the death of his parents as he raises his younger brother Toph. So lets see, I am rather behind on reviews so it has actually been about a week since I finished this one. To start off I found Dave Eggers style quite funny, the chapter with his mother dying was actually strangelly amusing (and yes I know that sounds strange) it was just the particular little aspects of the situation that he decided to highlight, they seemed so trivial and somehow to be thinking about those kind of things when your mother is dying was rather amusing. After a while though I found less and less to amuse or entertain me. At first I thought it was quite self-centred (I guess, that’s not really the right word). I know that writing about yourself is quite a self-centred act in a way but it felt kind of arrogant, like he thought he was always right. At first I found that aspect kind of funny in itself, I thought it was, I don’t know, sarcastc or something, but after a while it just became annoying, I wanted him to think he wasn’t doing something the best possible way just once. I must admit by the end of tje book I just didn’t like him, although there were still the occasional scenes which made me chuckle a little. This has been on my TBR for years. One of m friends read it in high school and he loved it. Maybe one day. I’ve always kind of thought autobiographies were narcissistic. It just seems presumptuous to think everyone wants to read about your life, but I do read them occasionally. I really liked this but I was quite young (18?) when I read it so the style was new to me and I was probably more forgiving of narcissism too! I picked it up again when I visited my Dad recently with an idea to re-read it soon so we shall see.